The complexity of the pipelines means there is no universal technical solution to all the safety challenges. But integration of existing technologies is a step forward. Jie-Wei Chen and Wolfgang Krieg report. The welfare of all nations depends on the steady flow of oil and gas through reliable pipeline infrastructures. Although the industry has made much progress over recent years, ensuring the safety of an energy transport infrastructure remains a great technological challenge. Winning this challenge ultimately depends not only on sensing technology however, which is based on modern physical and chemical knowledge. It also depends on many other related factors such as social education and awareness, government regulations and existing information databases for integrity management. Since the inception of 'modern' pipeline maintenance, which may be defined by the quite recent introduction of software-based integrity management systems, various potential threats to the safety of pipelines have needed to be addressed. These threats include natural events such as landslides or earthquakes, corrosion, accidental third party interference and also criminal action such as fuel theft and terrorist attacks. The pipeline industry has responded to the growing concern for public safety so that, nowadays, advanced technology for the detection of defects in pipelines is not only a means of protecting an infrastructure, it has far reaching economic and social implications as well. Due to the complexity of the pipeline safety issue, it has been recognised that there is no universal technical solution to all the challenges we face in the real world. Instead, the pipeline industry is realising the enormous value that can be delivered from integrating existing technologies to allow a combined analysis of multiple, independent parameters. Achieving optimum results demands an accurate and well-correlated information database plus powerful software to use and manage the database. Through these tools we can extract additional intelligence through the integration and analysis of all available information. If the software approach for asset integrity management is open and configurable for all existing and any new technologies, it then provides an excellent platform for solving complex issues in pipeline safety. In recent years, highly effective technologies for pipeline surveillance against third party interference have become increasingly available. 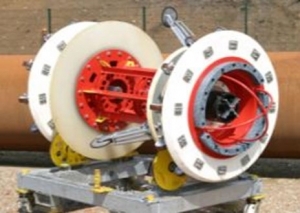 One typical example is fibre optic monitoring technology, which is designed for detecting various parameters, including temperature, mechanical deformation and acoustic emission within or near the pipeline. However, the market acceptance for new technology depends on economic considerations and for many existing pipelines fibre optics may not be the first choice for monitoring a pipeline environment. This fact has motivated the development of more conventional monitoring approaches. With advances in miniaturised sensor technology, pipeline monitoring can now be performed with a group of sensor-nodes, which are arranged to form a tightly correlated network. Wireless communication through RF and satellite systems makes a sensor network more flexible and cheaper to install. Satellite remote sensing technology with radar and infrared sensors provides another possible technological combination for proof of an event, including visual confirmation. Newly-developed cathodic protection systems using autonomous, networked sensors deliver information about the pipe-to-soil electrical potential at any desired location on a pipeline, leading to closed-loop CP-current regulation for optimal protection of the pipe. Such a system is also sensitive to any physical contact to the pipeline and therefore offers additional surveillance functionality. Inside the pipeline, in-line inspection with magnetic flux leakage (MFL) and electromagnetic acoustic transducer (EMAT) technologies offers more detailed information about the internal and external problems associated with corrosion, cracking and disbondment of the external coating. Leak detection can also be carried out by means of an in-line inspection tool carrying sensors for detecting leakage noise. For the purpose of protection against third party interference, in-line inspection technology is also used for detecting metal loss or undesired metal-enhancement, which may related to illegal intervention on the pipeline. All the above technologies are independent of each other, but they are all trying to expose any weakness of the pipeline from different facets. When all these different technologies are integrated on a single software platform, enhanced system intelligence for risk assessment is obtained. This enhanced intelligence can then be used to identify actual and potential adverse events, to suggest effective and comprehensive means for the reducing of risk, or to plan useful maintenance activities in advance. It can even indicate the need for future technology developments. Improving the effectiveness of the pipeline integrity platform by adding new technologies is a never-ending process. The ROSEN Group has already supplied the market with one of the most powerful software platforms available for pipeline integrity management, and is actively developing various real-time monitoring solutions. ROSEN is also aiding pipeline surveillance technologies by focusing on existing leak detection solutions based on ILI techniques, which are specially designed for convenient and low-cost frequent running by a pipeline operator. Jie-Wei Chen is Manager Corporate Technology and Wolfgang Krieg is Corporate Manager Marketing, ROSEN Headquarters, Stans, Switzerland. www.roseninspection.net.